The Nine of Wands card represents reserved strength, resistance, and persistence. Despite the irritations of a certain situation, you will fulfill the objectives and desires of the task at hand. If the divination is concerned primarily with someone suffering from an illness, then this card represents the recovery of the person with the illness. 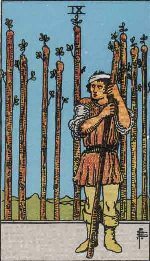 The Nine of Wands or the Lord of Strength card indicates that we should dive deep into ourselves with strength and courage and accept the realities. If we do that, we will find new vistas of wisdom that are lying dormant within us in our subconscious. The knowledge gained from our subconscious mind will help us to gain balance and equilibrium. It will build unshakable trust that will lend us support throughout our life. As we dive deep, we may find some facts that we would not readily acknowledge in our day-to-day life, but these truths will release a kind of new energy and strength that we may never have experienced before. This newfound treasure will help us gain an altogether a new perspective on various situations in our life. You will stop raising doubts and questions about the way things happen to you.